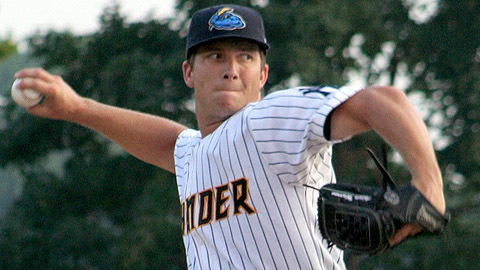 With a mid-90s fastball, Adam Warren posted one of the best pitching performances in Trenton history Wednesday. The Yankees' fourth-round pick last year, Warren set a franchise record with 15 strikeouts over seven innings as the Double-A Thunder combined on a two-hit, 3-0 shutout of the Bowie Baysox. Warren (4-2) fanned five consecutive batters from the end of the first inning through the start of the third. He struck out the side four times. "It's exciting," he said. "I didn't know the record going in. Through the game I wasn't really thinking about it. I knew my strikeout numbers were getting up there, but I was just thinking about the next out and getting ahead." Warren said he almost never shook off a pitch from Austin Romine, one of the Yankees' prized catching prospects. Warren said working with the organization's second-round pick in 2007 helped him transition to the Eastern League this summer. "I think I shook off him one time tonight maybe," Warren said. "We were really gelling tonight, and that's the way it's been all year. It makes it easier as a pitcher, you just get the ball and throw. It helps you stay in that rhythm and pound the zone." The right-hander from New Bern, N.C., broke the Thunder record of 14 strikeouts set Aug. 14, 1994 by Shannon Withem. Bowie, which managed one hit in the fourth and another in the fifth, had more than one runner on base just once off Warren. "The first inning kind of set the tone for me," said Warren. "I had one strikeout in the first, but I could tell hitters couldn't handle my fastball, it had good life. The strikeouts started to build as I went on, and that's something I take pride in, getting stronger as you go on." The UNC product said he was clocked between 90-94 mph with his fastball. "I was locating my fastball and putting them away with up-and-in fastballs," he said. "I was very pleased with my command." Warren began the season with Class A Advanced Tampa, where he went 7-5 with a 2.22 ERA in 15 starts, including one complete-game shutout. He joined Trenton on July 16 and has won four of his seven starts. Wednesday, though, marked his first double-digit strikeout performance in two years. "I threw changeups, curves an a slider to keep the hitters off balance," Warren said. "But my fastball was my strikeout pitch." Trenton took a 1-0 lead in the first on Dan Brewer's RBI single. Justin Christian and Romine added run-scoring doubles in the sixth and seventh innings respectively. George Kontos pitched a scoreless eighth and Ryan Pope closed out the ninth for his 13th save of the season. "It was really special for me," Warren said. "I hope I can do it again."